When I began to follow the tracks after the spot where the deer crashed, I noticed that about every so often there would be a couple drops of blood in the snow on the left side of the trail. I slowly tracked this buck for about 15 minutes attempting to catch a glimpse of him to make sure he was okay, at that point I decided to back out and just hope that the little guy would be okay. As any hunter knows, even though we take the life of an animal, we all hate to see the animals suffer. All I could think about for the next couple of days is how this area was know to have quite a few coyotes and other predators who loved to prey off weak wintering animals... I felt responsible for this buck and hoped that I would see it come next fall to see if it was alright. 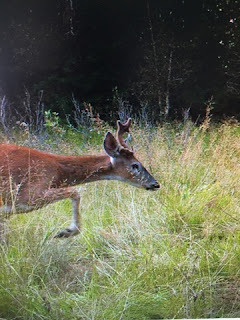 Throughout that summer and into the first part of fall I was unable to get a picture of a buck that I thought was the deer I encountered that winter. Then, luckily, I was able to catch a photo on my trail camera of a buck who was growing a odd antler on it's right side. I had heard that if a deer or elk happened to break a bone on one side of their body, the opposite antler growth is affected. I had always thought that was a myth, but when I caught this guy on camera I couldn't help but be convinced that this was my deer! Sure enough, I was able to get another picture of it which confirmed my thoughts, while at the same time, made my heart sink more. When I looked at this pic, I saw this deer's left foot completely busted, pointing in the wrong direction, and a huge bone growth cluster at the bottom of his leg... I could tell this buck had a rough life seeing how bad his leg was, I told myself I wouldn't hesitate using my tag on this buck if I saw it during the season, but unfortunately these two pictures were the only evidence/sign I had that this buck was even still alive. All season long, I looked for this buck with no avail. I assumed that some other hunter had taken the buck, and I hoped that the hunter was smart enough to realize it was a broken leg rather than some random growth or tumor. 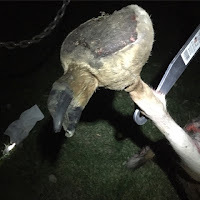 I was afraid that if another hunter took this animal they would leave the animal rather than pack it out because they were afraid to eat it due to the abnormality on his back leg as well as the odd set of antlers on this deer. 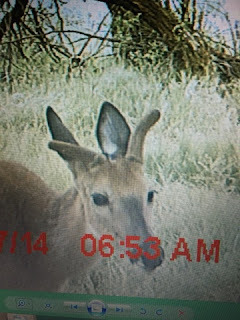 After the 2014 season I will admit, I didn't think about this buck much and pretty much called it off as dead or gone. 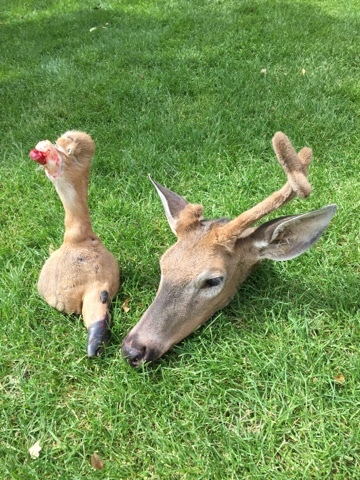 I spent the summer getting ready for the 2015 season as normal, and was even able to play a part in getting my cousin who is 23 years old into hunting. This was a great experience for me as I was able to answer a lot of questions, coach/mentor him while practicing his archery skills, and just spend some quality time with him. 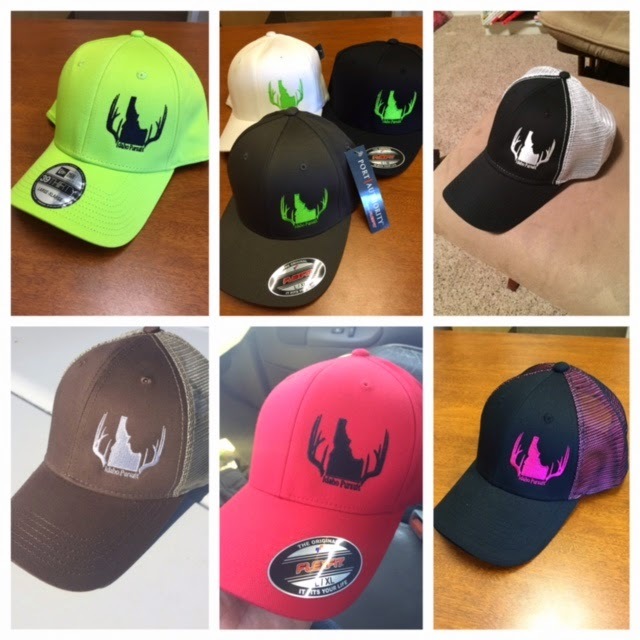 Of course, as any hunter would do, all summer long I was hoping more that my cousin would have success than I even hoped that I would have success. I wanted this first time hunter to be hooked, and experience the amazing moments that hunting provides. 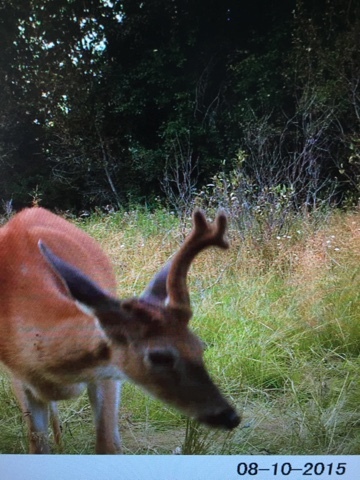 As the season got closer, my younger brother and I set out 5 different cameras looking to locate a few certain bucks in anticipation for hunting season. 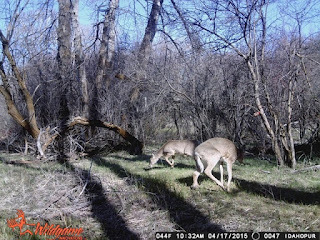 The very first week we pulled the cards, I was not only impressed with how many deer we had on our cameras, but I was thrilled to see that my buck with the broken leg was back in the area! This year, the buck's leg was almost twice the size it was the previous year and the antler growth was looking a lot more effected by the broken leg. 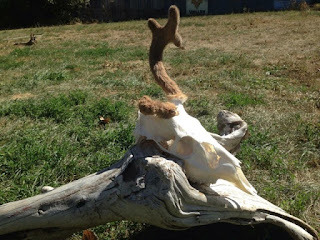 The left antler grew decent yet was not a typical white tail antler, while the right side was more of a failed attempt at any shape at all..
For the next few weeks, we kept pulling our cards and getting more and more pictures of deer. 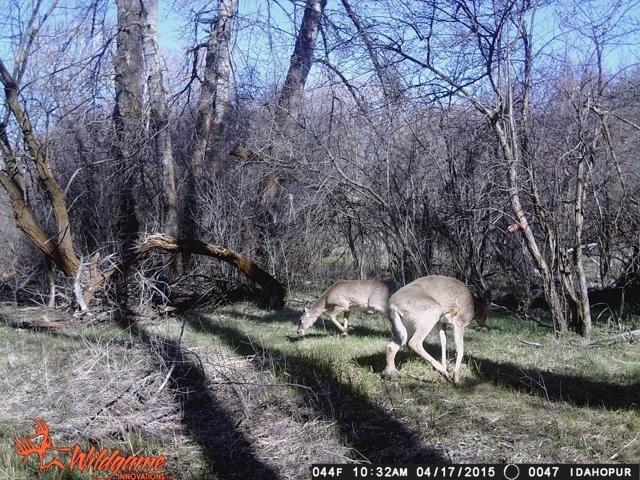 We were all getting excited for the season and felt that we would have a decent shot at a few of the bucks we were getting on camera. 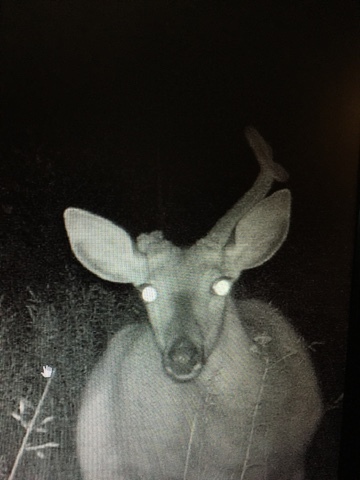 As the season was about to start, like always, the deer started to become a lot more nocturnal and the number of pictures started to decrease. Luckily, the frequency of "The Hoove" had stayed about the same. We were even able to get a few early morning or early evening pictures before the dark set it. Even though there were numerous other bucks with larger antlers in the area, I told every, I was seeking out to take that buck this year. 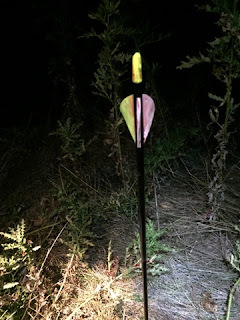 When the season started, I did what I typically do, and took off to chase elk the first few days of the season and then later that week decided to go after deer. 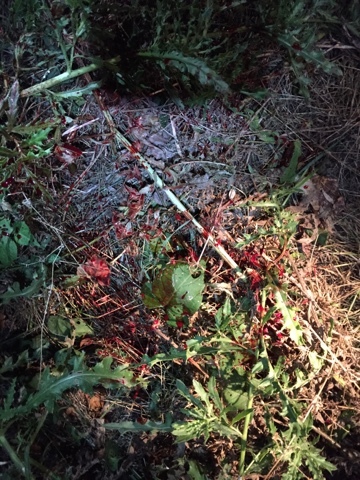 On September 5th, my cousin who I had helped throughout the summer decided to go back down where my younger brother and I had taken him a few days prior while looking for deer. That night he was sitting in one clearing while his other cousin was sitting in a different clearing waiting for the deer to move around right before night fall. Sure enough, at 7:48 P.M. my phone range... On the other end, my cousin Jeff was whispering to me how he had just arrowed his first deer at 28 yards away! The excitement in his voice and the adrenaline I heard running through his body was the moment I had anticipated all summer long when shooting bows with him in my backyard! I hurried home from the errands I was running and headed down to help take care of the deer. Jeff and my other cousin had waited until I showed up before they tracked it just to be safe. I had Jeff be the one to lead the way and follow the blood trail. By this time night had set in and we were using our lights to follow the trail. In less than 40 yards from where this deer was first hit, there it lay taking a dirt nap! 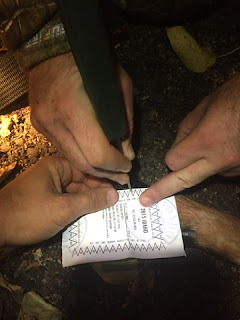 When we first found the deer, Jeff was needless to say, overwhelmed with emotions, not knowing what to do or how to feel other than the surge of adrenaline and assurance that he had just successfully tagged his first deer! 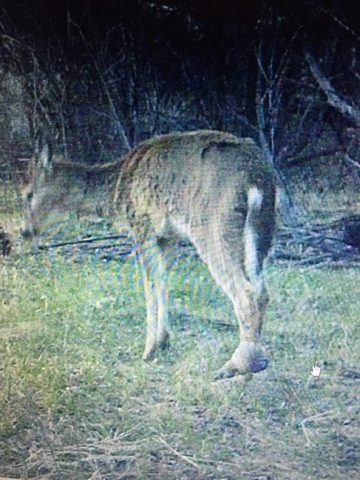 As I looked a the deer, I realized that the deer he had just tagged was "The Hoove" who I was set on taking this year! 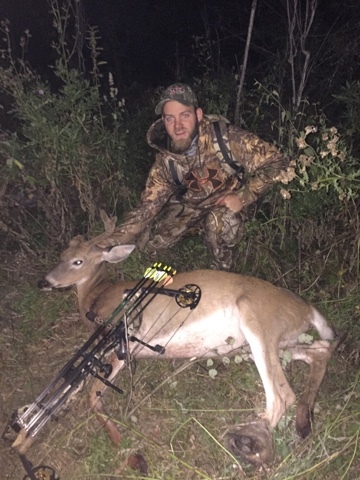 I was ecstatic that Jeff not only got his first deer, but also his first bow kill, as well as tagged a very unique buck! 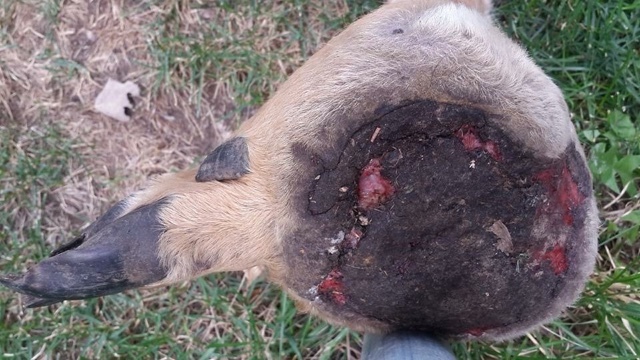 Without going into all the lengthy details of the pack out and taking care of the animal, I will just say that numerous times Jeff would say that now he knew why people say that hunting is addicting. He stated over and over again how he couldn't remember the last time he felt this good! He had work hard for quite some time practicing, learning, taking his hunter's education courses, and spending time getting ready for this moment. All of his preparation came down to one moment and he was able to seal the deal on the buck I had been following for three years. My emotional connection with this buck did not end after I was assured that he was tagged, instead, my respect and connection with this buck deepened as I could see just how strong and resilient this warrior truly was!